Oh-em-gee, this can’t be! How in the world can this be happening???!!! I have actually started to like David Beckham! And of course pretty pin-up poster boy finally set foot on Philippine soil... So why am I just that wee bit regretful that I did not part with some hard-earned cash to see pin-up boy and the rest of the Galaxy, after all? New and casual football fans in this country will, of course, not have a clue exactly how deep the Liverpool-Manchester United rivalry really goes, something that I already explained in another blog post. I have been a Liverpool fan since I was a boy in the seventies. 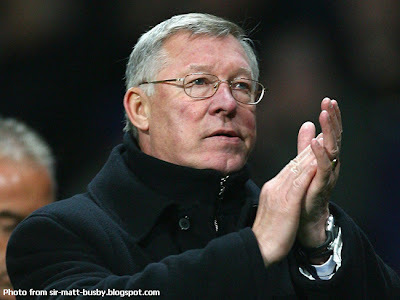 Because the Man Ure, as we love to call that Lancashire club with the archfiend on its crest, had knocked my club off its effing perch – swearword courtesy of non other than Fergie himself – we feel it almost obligatory to dislike – nay, hate – Manchester United. And Beckham, well, he was very much part and parcel of the United brat pack that brought about the reversal in club fortunes. Although David Robert Joseph Beckham was London born and raised, his parents were both die-hard Manchester United fans. The boy was special, even I would always admit. Steven Gerrard apart – who is several years younger; and naturally there is Scouse bias to this – there wasn’t a more cultured right foot in the world. Those who have never kicked a football in their lives will have absolutely no idea how unbelievably difficult it is to make that ball rise, bend and dip exactly where one wants it to. Yet Beckham, even as a young player, used to do it all the time for fun. People stopped breathing – whether they were for or against United – whenever a freekick was awarded in any significant area. Hearts skipped beats whenever Beckham actually kicked the ball. It was always as though he clandestinely inserted chips into footballs and controlled these with a remote hidden somewhere. While some of United’s brat pack already participated in the England national team that played in the European Championship of 1996, it was not until after the event that Beckham was called up for international duty. From September 1996 to the present, Beckham earned a total of 115 caps, a record for England. In an England shirt, Beckham was something of a dilemma for me. Although Liverpool has always been the club that I supported since I was a little boy, England has also always been the national team that I have followed and supported. So what was I supposed to do, like Beckham, then? It goes without saying that I really couldn’t. Tolerate was the closest that I could get to it. In fact, when Beckham got himself sent off in a perfectly winnable World Cup 1998 quarterfinal against Argentina for a typical instance of petulance, I went straight back to detesting him all over again. This was the same match when Michael Owen – an 18-year old then and still playing for Liverpool – scored a brilliant solo goal for England. Of course, the next day, Beckham was Public Enemy Number 1 in England. It was rumoured but never publicly confirmed that Beckham’s relationship with Fergie in the United setup started to deteriorate after his marriage to former Spice Girl Victoria Adams. Word was – at least to Fergie’s mind as well to that of the media – Beckham was starting to like the alternative entertainment lifestyle a wee bit too much. His relationship with Fergie was its lowest in February of 2003 after an FA Cup defeat by Arsenal. Beckham required stitches to his brow after having been hit by a boot kicked – some say thrown – by Fergie in the changing room after the match. The speculation on the aftermath of this well-publicized incident was not so much if Beckham would leave but, rather, when and where to. Move he did, during the summer transfer window of 2003. Por Dios! Why-oh-why to Real Madrid? If Liverpool is the club that I support in the Premiership, Real is the one in La Liga and Bayern München in the Bündesliga. I ask the question again: was I supposed to start liking him? It certainly did not help when it was widely reported that he had a lot to do in coaxing Liverpool’s talismanic striker Michael Owen to join him in Madrid in August 2004. 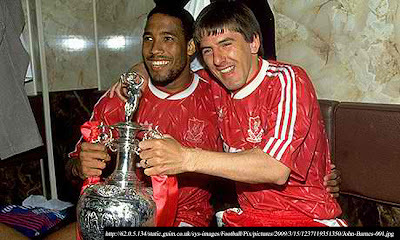 That said, I derived great satisfaction – as did most Liverpool supporters the world over – from seeing Owen warming his derriere in his short and totally unspectacular Madrid career. Beckham slipped under my radar when he left Madrid for a lucrative contract with the Los Angeles Galaxy and a subsequent loan spell at Italian giant AC Milan. I only follow the Serie A cursorily; and the MLS even less so. Then, a couple or so months back, the announcement was made that negotiations were being conducted to bring the Galaxy over during the club’s post-season Asian tour. Was I excited? Well, I would be fibbing if I said that I wasn’t; but only just that wee bit. I mean, I can still remember when Brazilian champion Cruzeiro, with the “white Pelé” Tostão, played at the Rizal Memorial Stadium I think soon after Brazil won the World Cup of 1970. Then it was, I think, in the early eighties when Español of Barcelona also played twice at the Rizal Memorial. Español is the city’s poor relation; but when it came, it was still a Spanish Division I team. That is not a lot, I know; but in terms of pedigree, the Galaxy still pales in comparison to either team. At least, that was my line of thinking until news shows started showing footages of Beckham, Robbie Keane – who played briefly for Liverpool – Landon Donovan and the rest of the Galaxy actually on Philippine soil. By then, it was starting to be – like – pinch me! Then there were footages of Beckham in a centre for former street kids, playing with some of the boys under the tropical sun; being shown around the facility by a teenage boy who possessively and poignantly held onto his tattooed arm; and even trying to learn how to sew from some of the centre’s girls. 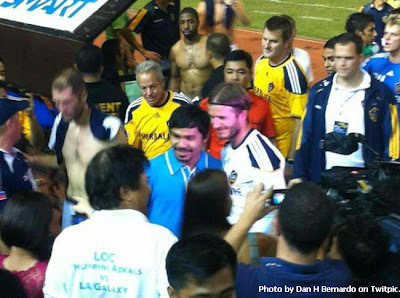 Another series of footages showed Beckham and the rest of the Galaxy working out with young kids in a training session at the Rizal Memorial. One particular shot showed Beckham sitting on the pitch surrounded by the youngsters. 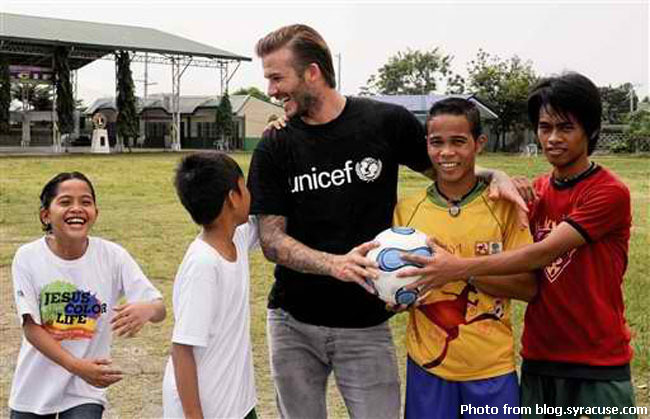 Beckham’s brand is professionally managed and, from the moment he arrived, he had said and done all the right things. But those footages of him working out with the kids weren’t contrived at all. He was really enjoying himself! Then, there was the game itself. 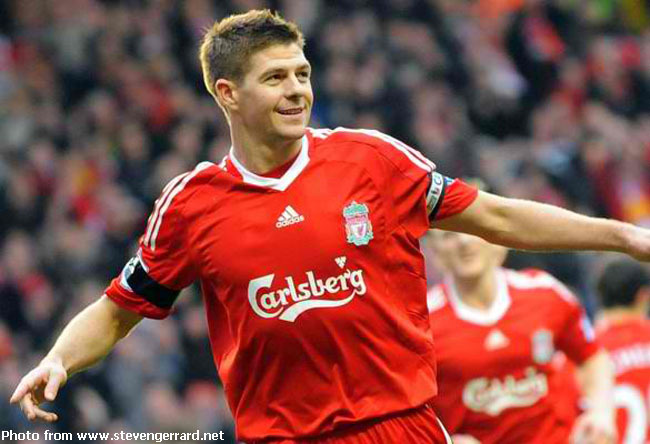 It was not so much his chipped goal that thrilled me no end – although even that had pure class written all over it. It was a fourteenth minute attempt to lob Philippine goalkeeper Eduard Sacapaño from almost his own penalty area that I could not stop gushing about. The ball eventually ended up behind Sacapaño’s goal but had it gone in, the goal would have been sensational! Upon being substituted, what did Beckham do but to take his jersey off, saunter over to the stands and reach up to hand it over to – who else? – Manny Pacquiao. Talk about knowing how to win Filipino hearts over! Finally, there was the post match interview which I watched on Youtube. All Beckham’s replies were standard public relations non-committal and vague, as was to be expected. He had already left the press room but returned moments later with a jersey that he, apparently, had earlier promised Phil Younghusband. 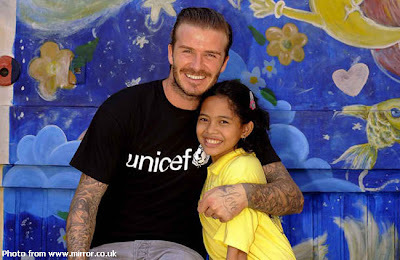 The selfish brat that the English press often used to paint Beckham as, there was no evidence of it during his brief but ultimately memorable Philippine sojourn. 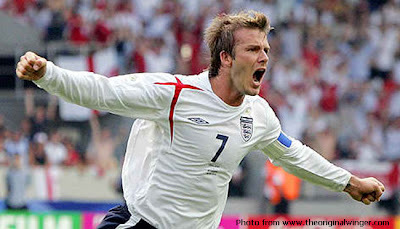 Perhaps, Beckham had simply grown up; or maybe the English press just got things all wrong all these years, who knows? There is a red anti-Manc warning light flashing on and off inside my head as I was writing this because, after all these years, the truth of the matter is that I have started to like David Beckham. Oh-em-gee! It’s complicated; but it’s possible, after all. All it took was for him to charm the Filipino in me.